1. OH! So you wanted to hear actual details about my pregnancy related doctor’s visit this week? How rude of me! The hip pain and locking I’ve been experiencing is, in fact, sciatica. Who knew? I met the third and final doctor of my practice and she might be my favorite so far…she curses more than I do! She began documenting my chart re: the sciatica so that I can get out of work as soon as possible. Apparently, (according to her) “insurance companies typically don’t give a damn when it comes to pulling a woman from work because of sciatica. They’re all run by men who do not understand this pain.” So we’ll keep record of it and I’ll stick it out another week or two, and I’ll be done working. My insurance is pretty lenient though; I was pulled for a hemorrhoid the last time around…. 3. I have developed a craving for anything containing apple compote. The Tim Horton’s by our house has a delicious apple cheese danish and I have had to set a serious limit on myself to 2 per day. I’m glad that none of the others in my daily path carry them, for I would be in big trouble. McDonald’s apple pies do not figure in to my 2 per day limit, in case you were wondering. 4. Lucy has taken to a fun new game where she asks such questions as “what if I turned in to a table?” or “what if I turned in to the ceiling?” I’ve taken to wanting to hurl myself out the window. 6. I am back to work on Monday, so more regular posting will follow. I am committed to catching up on blogs now, before Hub gets home. It’s impossible to get on the computer when he’s home. 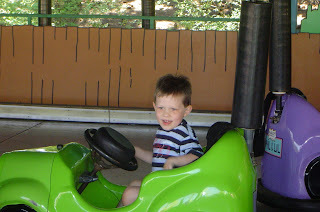 I am fearing that my blog will be severely lacking while I’m on maternity leave. Posted in friday free for all, random. Bookmark the permalink. 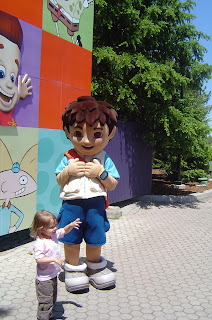 I LOVE pictures of kids hugging those characters! So cute, creepy or no.If you are in an Apple Phase, you should try Pioneer Woman’s apple fritter recipe. It has MOUNTAIN DEW. Hmmmm, I have seen that Apple Fritter recipe. It looks exceedingly rich and delicious, yet easy. You should review it for us. Also, I so remember peeing my pants all the time. Why does no one ever tell you about that, eh? My favorite picture is the swan boat one. I’m sorry. You’re all just so cute. Cute pics. The life size cartoon characters always squick me out just a bit though. Embarrassing pregnancy moments? Other than looking like a whale, nothing particular comes to mind. I didn’t start involuntarily peeing until after delivery, surprisingly. Not fun. I forget what I was going to write because now all I can think about is looking up that apple fritter recipe…. It looks like such a fun day!! What fun. 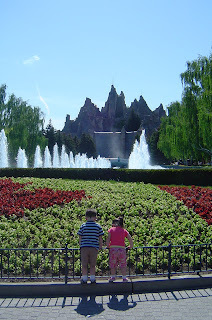 Maybe have to try Cananda Wonderland….I believe I’ve already told you my most embarrassing moment: when I was in the hospital for the kidney stone and ended up puking AND peeing at the same time and all over myself. Then the nurse chided me for trying to clean it up. OH God. Just let me get back onto my bed in dignity, ‘K?I was a bit embarrassed when we went to Hershey Park and I almost fainted while in line for the kiss-making exhibit. But for my husband, not really for me. Poor John. He just didn’t know WHAT to do. Know what? 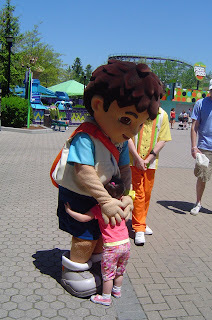 The giant characters aren’t quite so creepy at Sesame Place. Maybe ’cause they’re renditions of muppets and not cartoons…? 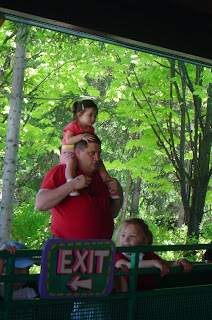 Wonderland is AWESOME! 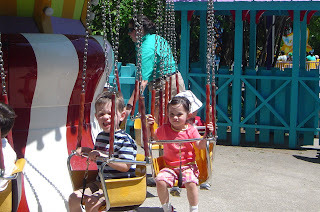 It’s been 4years since we went, but we had a blast. 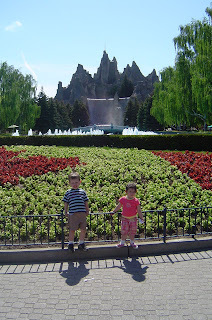 We have told the kids we’ll go back, since only Meg was born when we went. 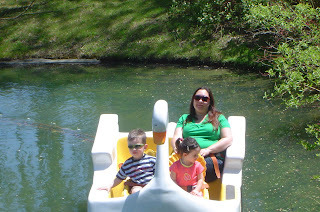 We stuck to the NickJr section of the park and it was awesome.Oh,and I always peed when I was pregnant, especially with the twins. All that weight on my bladder…..sigh. Your latest OB sounds terrific! I hope she delivers you.LOVE the pics, esp the ones of the kids with their backs to you.Sorry it’s back to work for you next week. Bah! Hey, it’s great that your maternity leave starts up soon. I do hope that you’re not too miserable with all the problems though.My embarassing pregnancy moment tops all I’ve read here. A week after finding out I was pregnant I passed out (and possibly seized) during a church service….right in the middle of the sermon…right towards the front where EVERYONE saw. OK, so it was scary and embarassing. But when I came to the pastor was leaning way over from the platform saying “Is everything OK over here?”. Like it wasn’t bad enough that everyone around me came running, now the WHOLE church knew and everyone was staring. Then they called an ambulance and I was transported away while they went back to the service. The good news was that there were several doctors nearby to help, and there was an OB nurse (who we’d never met) sitting near us. But I hadn’t told anyone (except one friend) that I was pregnant, because it was so early and my first OB appointment was the next day, and after that EVERYONE knew I was expceting.Your trip looks fun and I love all the photos. I agree that Diego is a bit creepy. Eek.